"Windows PC-Based Machine Automation: Benefits of soft motion approach"
As software-based machine control begins to replace expensive hardware solutions, more organizations are weighing their options for soft motion vendors. Learn how each of these offerings stacks up against 5 key dimensions, including real-time OS (RTOS) with Windows, basic motion control, the ability to support the soft motion and EtherCAT Fieldbus, and cost. 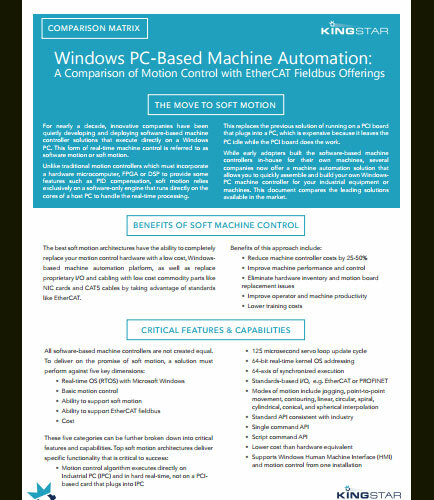 If you’re considering a soft motion system, download “Windows PC-Based Machine Automation: A Comparison of Motion Control with EtherCAT Fieldbus Offerings” today.